The biggest take away for me was the idea that real freedom come if you can successfully separate your income from you location. Ferriss estimated by doing that you automatically increase what the money is worth to you by 3-10 times. And thereby you enable yourself to seek the things that really make you happy. 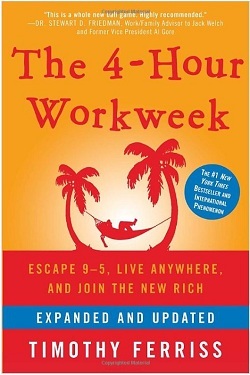 I was just about ready for a significant life change, when the 4-hour workweek came across my desk. I can’t recall how that happened but the timing was perfect. Timothy Ferriss have become a bit of a celeb after this book, and a few others that followed. The old industrial era model of working for 40-50 years to retire and then do the things you like is broken. Or maybe it has always been broken, and we are only realising it now. The first challenge the model face is that most people end up having to continue working to maintain their lifestyle. More and more people are also realising that many things, mostly activities, you want to do is not possible when you reach that age. The New Rich is a new breed of people practising Life-style design and seeking adventure, for them the old ideas of retirement is the worst-case scenario. By understanding that income is all relative to the time you have to spend to earn it. The New Rich also realize the timing is never right to make the life-style changes needed to life a fulfilled life. Ferriss also remarks that the opposite of happiness is NOT sadness but rather boredom. So to lead a happy life you should seek excitement. Look for the things that make you excited about getting out of bed every day and no day will be a work day! I really loved this book, and it has had a huge impact on my own ideas of what I would like to do with the rest of my life. You should read it! This entry was posted in Book Reviews on 2012/11/14 by Justinus.